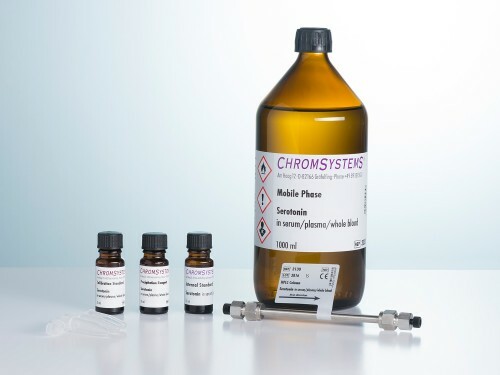 This kit allows for reliable HPLC determination of serotonin in serum/plasma and whole blood as part of routine diagnostic laboratory testing. Easy and fast sample preparation leads to exact and reproducible results. The chromatographic determination requires an isocratic HPLC system with electrochemical detection. Calibrator and quality controls are available separately – they are produced from pure human matrices to prevent matrix-associated measurement variabilities. 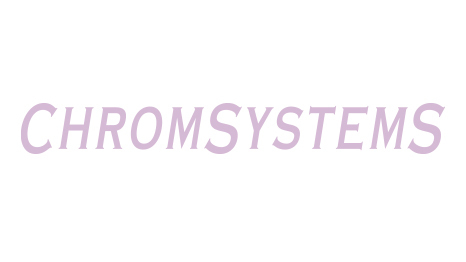 Alternatively, Chromsystems offers a kit for determining serotonin in urine (# 4000). Care has to be taken to destroy all platelets completely. Recommendation: intensive clotting by the use of serum tubes with clot activator. Centrifuge at least 10 min at 1500 g [Reference: DG Klinische Chemie Mitteilungen 1998; 29(3)]. When measuring serotonin in plasma it is essential to obtain cell-free plasma without destruction of platelets. For this purpose the addition of an anticoagulant is necessary. Recommendation: Centrifuge minimum 15 min at 2000 to 3000 g [Reference: DG Klinische Chemie Mitteilungen 1998; 29(3)]. Centrifuge EDTA-whole blood at low speed (1500 rpm, 15 min). The obtained platelet-rich plasma is centrifuged again at high speed (4000 to 5000 rpm, 5 to 10 min), and the platelet concentrate can be collected from the bottom of the tube. Vortex 100 µl serum + 100 µl Internal Standard + 100 µl Precipitation Reagent in a reaction vial for 30 s.
Incubate 10 min at +2 to +8 °C. Centrifuge 10 min at approx. 13 000 rpm. Inject 20 µl supernatant into the HPLC system. For the determination of serotonin in plasma it is necessary to dilute the Internal Standard 1:10 with distilled water. Dilute whole blood samples 1:1 with distilled water before adding the Internal Standard. At +2 to +8 °C up to 12 hours. Freeze the samples if they are not analysed within a period of 12 hours after blood collection. For the HPLC analysis of serotonin any isocratic HPLC system with electrochemical detector is suitable.